What a creative day! We thought about different ways Easter time is celebrated and the new life that comes will Spring. Our trip to the EIS! We had a debate,was it right for the Monkey to steal Handa’s banana? We sing lots of songs to support our learning, here are some of our regulars that we enjoy. Celebrating World Downs Syndrome Day with our wonderful socks! 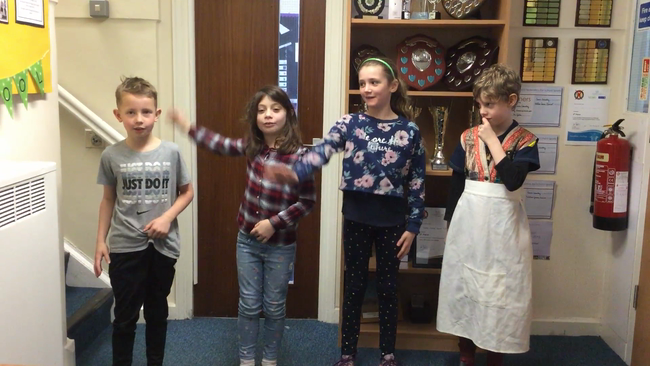 Here is a snippet of the song and actions for our Y3 production on Friday! We've had a busy day as the school photographer has been in! We had photos with the IR and with our mainstream class. Y3 and Y4 have also been rehearsing hard for their production on Friday. Happy World Book Day! The whole school was buzzing with stories and fantastic costumes: from Fantastic Mr Fox to the Cat in the Hat! Miss Honey aka Mrs Longbottom was nervous to discover the Trunchball (Mrs Stringer) was in the classroom next door, but we survived the day - even though none of the teacher’s computers were working! We explored some of our favourite books through sensory play; shared our chosen books with each other; used objects to inspire our own story writing and got to write poetry with a professional poet! We’re in full swing for Science Week! In the IR we explored what plants needed to survive investigated how water and nutrients get from soil to the plant. In mainstream, Y6 turned balloons into rockets, Y5 investigated states of matter, Y4 worked with electricity and Y3 are busy rehearsing for their production! 2 very different days today! Were you on a trip on Ethel Barge or measuring with cubes? And what was that pesky monkey up to? Weighing fruit for Handa's basket. Handa wants to take 7 fruits to share with her friend Akeyo. We collected lots of fab vocab to describe the look, feel, smell and taste of these exotic fruits! What’s you’re favourite? Sorry we’ve had a few technical difficulties but here we are looking at items from Miss Knowles’ time in Ghana! Thank you Y3-6LH for a lovely first day back! In English we made a prediction about what would happen in our story, Handa's Surprise - no peeking to find out yet! We enjoyed hearing about each others' holidays and this afternoon in mainstream between us we did English, topic, Spanish and PE! What a day! Wishing everyone a lovely holiday - see you on the 25th! We learnt about St Valentine and his letter to his love Julia and created our own crafts. In mainstream, Y3 built Stone Age houses, which were very impressive! We compared the story of the Three Little Pigs and the Three Little Wolves and asked what’s the same? What’s different? Experimenting with bold colours for Chinese New Year! We made lanterns and decorated the animal that represented the year we were born. Mrs Longbottom is a dragon! We have been making choices about how to group objects and identifying what’s the same and what’s different. Getting our mathematical brains whirring. Choosing vocabulary to describe the characters in our story. A crime has been committed at Nether Green Junior School! We put on our reporting hats to investigate - looks like the Big, Bad Wolf has been up to his old tricks!